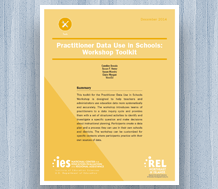 The Practitioner Data Use in Schools: Workshop Toolkit is intended for use by district leaders, school officials, teacher leaders, and coaches who want to conduct workshops on data inquiry and data use at the school level with school-based educators. Written by researchers at Learning Innovations at WestEd, this kit contains a facilitator guide that provides materials to engage educators in using data for inquiry and instructional planning. Also included are workshop handouts that offer tools, protocols, and resources for each step of the data inquiry cycle. Visit the Practitioner Data Use in Schools: Workshop Toolkit resource page to learn more and download a free copy.